May 29, 2011 in Lists, The Fighter, We Like Non-Oscar Movies Too! But first a special shoutout to Becca. At least three people are reading these things! Becca claims she’s laughed at loud multiple times while reading my posts. She was kind enough not to specify whether that’s due to my rapier-like wit or my general lack of understanding of the English language. I’ve made my feelings on The Fighter pretty clear in prior posts. To briefly recap, like everyone else I’m fine with the acting awards, but everything else about the film is terrible. In particular, I find the script to handle time very poorly and to derive unnecessarily wicked glee at insulting powhitetrash, and the boxing scenes to be pretty atrociously done (Mark Wahlberg has boasted that the scenes were shot in less time than planned, and I think it shows). Now, a lot of people think differently than I do, some of whom I even respect. The only logical conclusion I can draw is that Wahlberg has personally intimidated each and every one of them. Saw this one in a plane. Though I was going to see it anyway, because of my Nic Cage fetish, which is totally normal. Maybe I’m jaded, but to me, the film felt more like an origin story for a franchise than a standalone adventure. Which may be for the best, because I heart Cage and Jay Baruchel way too much for them to be mired in more of these clunkers. I imagine I lost out on the special effects, watching on those tiny plane monitors and all, but they rarely sway me anyway, especially when the dialogue is as awkward as it is here. Not really relevant, but decades-old jokes about plane food aside, if you are ever fortunate enough to sit in first on a United flight where they are serving a meal, chow down, it is fairly decent stuff. Unsurprisingly, I’ll watch just about any sports-related romcom. Even basketball, which is a silly, heightist sport. If you missed this one, Queen Latifah plays a physical therapist who after a meet-cute begins privately treating a veteran NBA star (Common). Meanwhile, her attractive best friend (Paula Patton) who wants nothing more out of like than to be a trophy wife, starts dating said NBA star. Love triangle! The film’s problems may have started with Common’s character, who is just incredibly milquetoast. There’s making a supposed celebrity down to earth and there’s making him like your uncle Mort. Which maybe was needed to believe a celebrity would ever go for a girl like Queen Latifah over one like Paula Patton? Also, I have a lot of respect for Common, I enjoy his music, but here he is just so wooden. (I was going to make a John Wooden pun, but it would have been both stupid and over my head). All of the characters lack nuance, really. Which bleeds into their relationships, which are more assumed than ever really demonstrated. Phylicia Rashad and Pam Grier are pretty awesome, naturally. The name is something of a misnomer, as the script was based off of Cherie Currie’s book and I read somewhere that the producers were unable to get the rights to all of the band members. So you have Alia Shawkat and Scout Taylor-Compton in the background in some scenes, but the film pretty much focuses on Currie and Jett. The film made some noise because of the intimate scenes between Kristen Stewart and 16 year old Dakota Fanning, and hey, did I just see Brian put the film in his queue? Which, yeah, they do exist, but the sexualization of Cherie Currie is a significant point the film is trying to make. I don’t think writer/director Floria Sigismondi really tells a very good story here, though. I think she, like the world she depicts, gets so distracted by Cherie Currie, she fails to see how the whole band is needed to at least fill in the details. I’m admittedly not super familiar with the story of The Runaways, but I’m not really that much more so after watching the film. I thought Michael Shannon was pretty fantastic as the band’s completely over the top manager. I’m pretty sure I saw this one on a plane. That’s the story I’m sticking with, at any rate. The film is incredibly broad, with all the physical comedy and blindingly obvious life lessons you’d (sadly) expect out of an Adam Sandler movie these days. It isn’t worth rehashing the story, as the plot is incidental at best, missing at worst. The frustrating part to me isn’t that the film took in $160 million, it is that no one seems to be willing to try a movie that is even just a little bit…”smarter” is the wrong word, but it is the best I got. You’ve got so many people who are so talented at being funny on broad scale, why not widen the audience just a little bit more? I’m not saying cut Kevin James’s pratfalls, but the arc where Adam Sandler’s kids are obnoxiously over the top spoiled and they learn what it is to be a kid or whatever, that’s something you can make actually meaningful, with a little effort. More evidence that stars are nothing without a good script. I mean, hey, the star power got me to see the film, I’m not suggesting producers stop paying big bucks for famous people. I think it is pretty interesting to compare Love Actually, He’s Just Not That Into You, and Valentine’s Day. Because for me, while I do remember the actors in each, what really sticks out in each are the memorable storylines. For Love Actually, that’s just about all of them. In He’s Just Not That Into You, it is Ginnifer Goodwin, Kevin Connolly, and Justin Long’s stories. In this one, well, there sure were a lot of pretty people. And that what these things have become: let’s see how many famous people we can cram into a movie. It has to stop soon. Right? Allan Loeb is well on his way to joining the ranks of my least favorite screenwriters. He’s going to have to work on it a little, though, because he’s not quite at the point of sucking all the interest out of interesting topics (though 21 suggests he’s close). There’s nothing bad about The Switch, per se, but there’s nothing good about it either. There’s just nothing. It isn’t funny or dramatic, but it isn’t sad or melodramatic. Part of it is may be that Justin Bateman and Jennifer Aniston, when you get down to it, really are both straight men. Left without anyone funny to play off of. Maybe if Jeff Goldblum had a bigger (or relevant, at least) role? Or if Patrick Wilson, who I love, wasn’t also written as a straight man? The premise is a stretch, but it probably could have worked, in more capable hands. What a badass poster. Wow. John and I discussed the film a little in our Supporting Actress recap. In case you missed it, I was watching this film with Brian at his place, and apparently was knocked out cold. Brian said nothing, even shooting a nerf gun at me, could wake me up. I did go back and watched what I had missed. The movie may the most boring film ever described as a crime drama. You know what’s exciting? Crime! You know what isn’t exciting? People talking about crimes about which you have almost no context. Jacki Weaver was good, and with a character written how it should have been, she’d be Oscar-worthy. Oddly enough, I was in a 7-11 with Brian last week when he pointed this movie out to me on the rack of misshapen movies that 7-11 always has and asked if I’d heard of it. I’d seen it, of course. One has to keep current on one’s Tim Allen movies. It is a little hard to recap this movie because what I would consider the movie’s twists were all revealed in one trailer I saw. But basically Tim Allen owns a small local chain of businesses, has been married five (or six!) times. He comes back from a vacation in Mexico in a coffin. 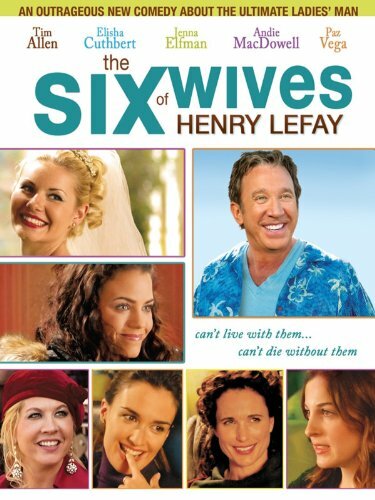 Hilarity ensues as all of Tim Allen’s past and present wives (in no particular order: Jenna Elfman, Andie MacDowell, Lindsey Sloane, Paz Vega, Jenna Dewan, and S. Epatha Merkerson, if I remember correctly) fight over the funeral arrangements. And Elisha Cuthbert, who is surprisingly good here, stars as Tim Allen’s daughter. There’s a good movie in here somewhere, and you could probably keep this same cast. But when you are asking Elisha Cuthbert to carry a movie, and she isn’t looking like she did in The Girl Next Door (to be fair, that’s Hall of Fame attractive), you need to have some sort of focus in the film. But so much time is wasted on Cuthbert’s personal sideplot (Chris Klein is involved, which should tell you all you need to know) and establishing how crazy all of the wives are, that the various twists lose their impact. And the ending just fizzles out. I’ve actually read the novel on which the film was based, it is a kind of mathy knockoff of The Da Vinci Code, only with all the charm you’d expect of a mathematician writing a book. And I say that as someone who did math team for three years. Anyway, I’m not here to review underwhelming books, I’m here to review underwhelming movies. The casting is way off here. I don’t know if maybe all first, second, and third choices turned the producers down after reading the script or what, but no one feels comfortable in their roles. I don’t have any feelings either way on Elijah Wood, but between him and writer/director Alex de la Iglesia (who co-wrote with Jorge Guerricaechevarria, who I mention not only because he has a completely absurd last time but because it is the same team who did The Perfect Crime, which suddenly makes everything make sense), the decision to imbue the main character with pretty much no emotion or defining traits probably is one they want back. I guess you could point your favorite math teacher to this film, they might thank you. Or perhaps better, point your least favorite math teacher here.